Founder and director of Sophia Venus, I bring 45 years of experience in using the language of astrology to people seeking answers and guidance about life’s questions. I believe the language of the cosmos, together with earth wisdom (Sophia) are the beacons of light necessary to guide us to the future that we as individuals and we as a species seek to create. After 30 years into the field of astrology, I wasn’t searching for any new techniques. I’d been to all the conferences and heard most of the leading astrological authorities of our times. In those years, I collected and synthesized a personal way of working with astrology that involved mythology, archetypes, dreams, healing, psychological and spiritual insights through astrology and more. My particular loves were covered in the two-volume set of Mythic Astrology I co-authored with Kenneth Johnson. Another love was planetary astro-mapping, after having been certified by Jim Lewis (in 1986) and moving on to incorporate into Astro*Carto*Graphy some new methods of astro-mapping, including the use of asteroids, nodes, Chiron, and Local Space. What emerged from that was my passion for Geodetics (Earth Astrology) whereby the planets transit around the Earth, forming “hot spots” during certain periods of time. So, this is all leading up to say – I had my hands full! But then, in 2004, during the first transit of Venus across the Sun, Venus began streaming information to me about her pentagram and individual star points. It was a body of knowledge (I was “told”) might take a full century for people to really grasp. But it was new and exciting and proven to be astoundingly accurate in personal chart work. 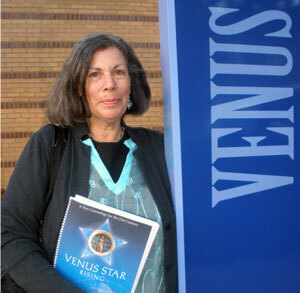 Seven years later, the information that was given, came out in the book Venus Star Rising: A New Cosmology for the 21st Century. Since then, I have devoted most of my practice to using this material in ways that can open people’s eyes to the unconscious drives and needs that motivate them in life. Check it out for yourself. It has been twelve years now since the Venus Star Point theory arrived and I am still as captivated by its message as I was then. It is truly the starting and ending point for me in all my astrological pronouncements. Finally, (I believe) Venus has been restored to a much grander and fuller archetypal energy than what has been attributed to her. Her Star or Pentagram, is the Cosmic Heart Beat of the Earth and its inhabitants.